An image of the Rosette Nebula, one of the nebulae featured in the new book "The Armchair Astronomer — Vol. 1 (Nebulae)." A new e-book that introduces readers to cosmic nebula — massive clouds of gas and dust that often harbor newborn stars — is easy to read and loaded with inspiring imagery. The work of astrophotographer Terry Hancock has been featured extensively on Space.com, so it's obvious we're big fans of his stunning cosmic snapshots (which you can also see on his website) that often capture large regions of space and massive cosmic objects. An image from the new e-book "The Armchair Astronomer — Vol. 1 (Nebulae)," featuring text and images about 15 space nebula (massive gas and dust clouds that often host star birth). Some images in the iBook version feature labels that provide additional information about the nebulae. "This book is about nebulae — massive clouds of gas and dust set aglow by the borrowed light of stars," Ventrudo writes in the book's preface. "While they seem like natural works of abstract art, nebulae also capture the attention of professional astronomers because of what they can teach us about the composition and life cycles of the hundreds of billions of stars in our galaxy. Our sun and the planets and most of the objects in our solar system, for example, as well as the atoms in your own body, were once embedded in a glowing reddish-pink nebula that faded more than 5 billion years ago." Available in the U.S. for just $4.99, this first volume of "The Amateur Astronomer" is available as an Apple iBook, a PDF file or a standard e-book for the Amazon Kindle. The PDF version of the book features high-resolution images, and is laid out beautifully, with Hancock's images interspersed throughout the text. In the Kindle version, images are standard resolution for Kindle. The iPad version comes with a bundle of bonus features. The images are placed in galleries, so they can be seen full-screen. Some of the iPad images have labels that readers can tap to have more information revealed. The iPad version also includes short videos, produced by the European Space Agency, that appear to zoom in on images of various nebulae (the only images in the book not taken by Hancock), providing an almost 3D view of these massive clouds. Hancock is an amateur astronomer, meaning he is not employed as a space scientist or an engineer. But like so many amateur astronomers, Hancock's work is of a professional grade. He takes all his own images using personally owned telescopes and cameras, and edits and produces those images himself. "The entire cost of the equipment to produce these images is less than that of a compact car, yet these images rival those taken with the world's largest multimillion-dollar telescopes just 10 or 20 years ago," Ventrudo writes in the book's preface. "The images in this book also have sufficient detail, structure and color to hint at the fascinating processes within each nebula, and they offer the 'armchair astronomer' an opportunity to see and learn about the life cycles of stars in our own Milky Way galaxy and beyond." The horsehead nebula, taken by astrophotographer Terry Hancock, and featured in the new book "The Armchair Astronomer — Vol. 1 (Nebulae)." In each chapter, Ventrudo explores an individual nebula or nebular region, delivering details that scientists have been able to glean about these puffy cosmic landscapes. The Veil Nebula, for example, was formed when a star about eight times the mass of the sun exploded, shedding its outer layers in an expanding shell that appears red, white and blue in Hancock's photo. This chapter ends up giving readers a brief description of a supernova — a star that runs out of fuel and dies in a major explosion. 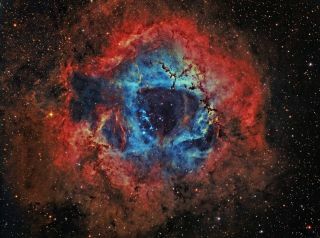 Readers will notice the wide variety of colors seen among the nebulae — red is a common color, but some also feature bright yellows, aqua blues and vivid pinks. The nebulae also display amazing variation in shape and structure — earning names like "The Ring Nebula" and "The Dumbbell Nebula." Ventrudo talks about the reasons for those different shapes and colors in the chapter text. Ventrudo is the publisher of the Cosmic Pursuits newsletter, which features articles about stargazing and astronomy written by Ventrudo, as well as curated content from around the Web. Ventrudo has a doctorate in laser spectroscopy, initially doing work to help study the chemical fingerprints of cosmic objects, and later becoming a research scientist in the field of lasers and fiber optics. Overall, "The Armchair Astronomer Part 1: Nebula" is rich in both text and images, creating a delicious treat for astronomy fans.